On the footsteps of an unsual band of carol singers. 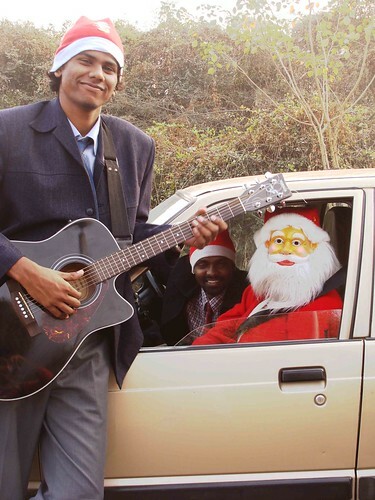 The Aravali hills are alive with the sound of Christmas carols even though the D-day is still two days away. In the rarefied air of Jawaharlal Lal University (JNU), a tune of guitar-twanged Jingle bells, jingle bells… is soaring up in the air. It is floating somewhere over the Staff Academy Center, a smart brick structure tucked deep into the bowels of the JNU campus. 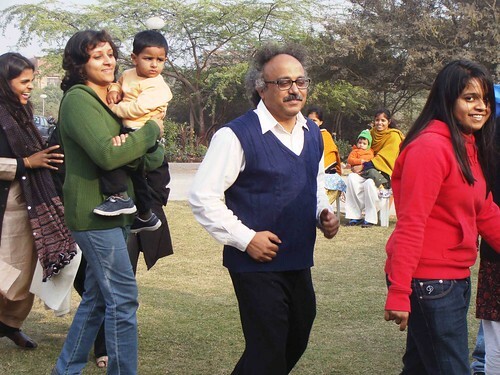 An incredible sight here – a few of Delhi’s most cerebral people making an all-in-good-fun fool of themselves. The chief editor of a big publishing house, a senior journalist, a Physics professor, and their little baba-logs… all playing poo-chuk-chuk in a make-believe Rajdhani Express. The engine is – Santa Claus. 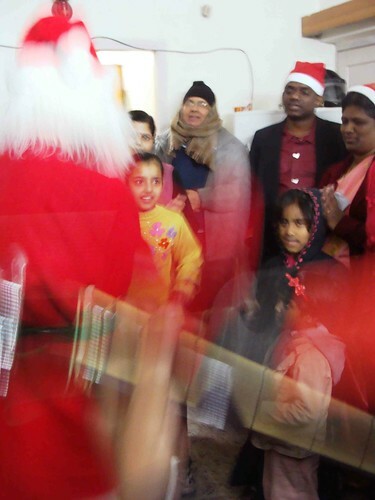 This Santa hasn’t been gifted by the Indian Railways. He is a part of a choir group which on the days leading to Christmas is hop-scotching to different localities in the city. 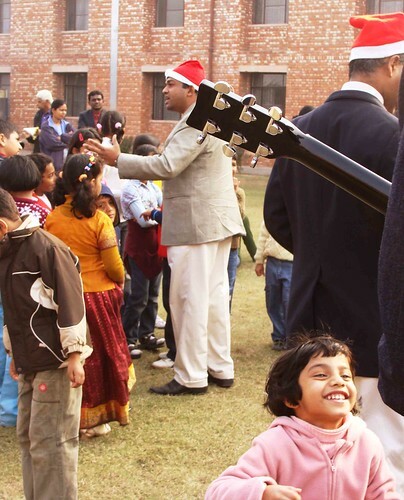 At each place, they sing, dance and give a short sermon on the “meaning of Christmas.” Yesterday they were in Sukhdev Vihar. 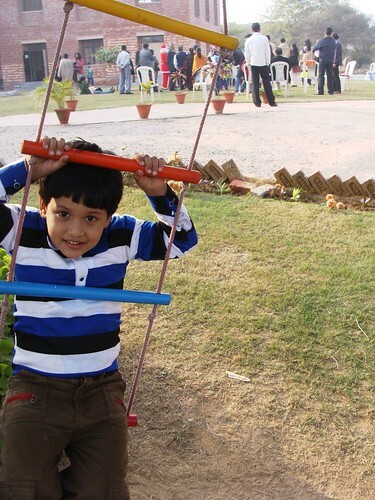 Tomorrow they will be in Vasant Kunj. The choir is unique not just because it has no official name but also because its members, all South Indians, are ordinary muggles in ordinary days. The leading singer-preacher is a GM in AirTel. There is a PhD scholar, an environment professor, an electrical engineer. The guitarist is a… web designer! “We are all friends with busy lives and find this time of the year a good opportunity to hang out together,” says Mr Sunil, the electrical engineer. 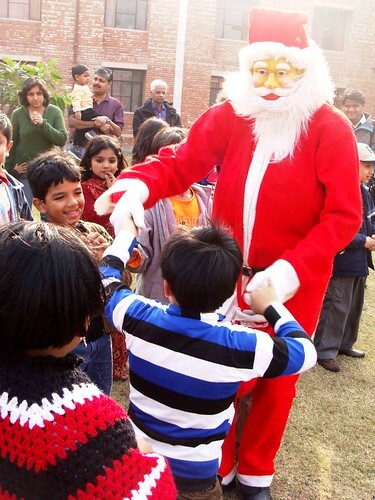 “Usually we go to each other’s houses, have a blast and take Santa to meet their neighbours.” A few evenings ago, they were in an Indirapuram apartment where they drew in around a hundred residents. Here in JNU, the crowd is less. The high-brow crowd shows signs of restlessness. “The music’s fine but I do mind the preaching,” the publisher tells me on the condition of anonymity. Like most here, she hadn’t come for the choir but to celebrate the 8th birthday of a friend’s son. The Varmas are delighted but also puzzled. The maid appears clueless. It’s like a cultural shock to which the family start opening up as the Santa starts dancing. Colonel Varma’s old mother starts tapping her fingers. His old father, attired in a monkey cap and a muffler, has returned this morning from the hospital after a surgery. As if on cue, the preacher makes a prayer for the senior Varma’s heart. The next destination is next door to the home of Lieutenant Colonel Virinder Singh in whom the choir finally finds its match. This Singh looks like a king. Big moustache, broad shoulders, and a booming voice. He take things into his own hands and start jiggling to Bhangra beats(!). Santa is truned to a Daler Mehendi clone. The sight is amazing. It’s like Chennai meeting Chandigarh, girijaghar meeting a gurudwara and jingle bells… becoming balle balle. After a few minutes of ‘North Indians-South Indians’ bonhomie, the choir leaves for Colonel Rubin’s apartment. There they will call off the day. Tomorrow, they will meet at Vasant Kunj. After work.